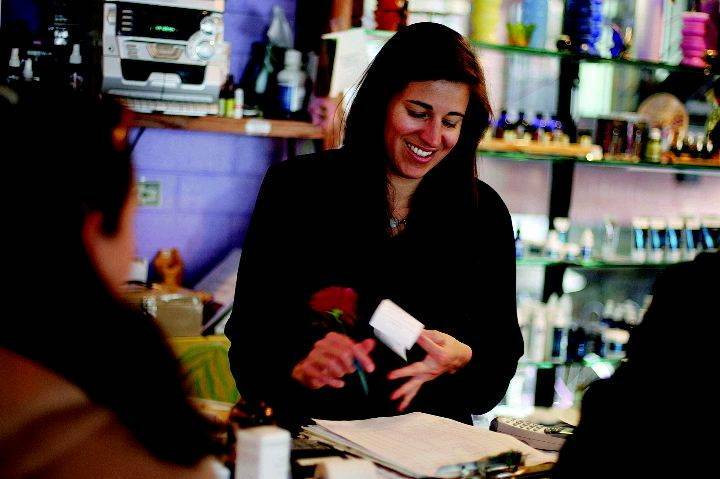 Jennifer Marcus, owner of Daughter Earth at 533 E. Hopkins Ave., is selling her shop, she says, because the street market has taken away her business. Aspen Times photo/Jim Noelker. The Aspen Saturday Market may have just claimed a victim, one frustrated shop owner says.Jennifer Marcus, owner of herbal apothecary Daughter Earth on Hopkins Avenue, says her shop will close this spring since business has dwindled under competition from the crafts offered at the market in the summer. Daughter Earth opened in June 2001, selling all-natural skin-care products, specialty teas and bulk dried herbs as remedies for life’s ailments.At the time, the Saturday Market along Hopkins Avenue was simply a farmer’s market, featuring several tables of produce and fresh herbs grown in Paonia. Crafts and cooking demonstrations were featured in Conner Park, just east of City Hall. Marcus said her business pulled in $1,000 in net profits each Saturday during that first summer. Business boomed during her first summer, and dropped off during the winter, she said, because fewer people meander down Hopkins Avenue to shop when the weather is cold.But during the summer of 2002, Marcus said, business wasn’t as lucrative when craft booths were added to the street market.”They didn’t leave space in front of storefronts, so traffic is channeled down the center of the street, not on the sidewalks,” Marcus said. She said she tried to participate by featuring a masseuse on her front lawn and handing out coupons, but foot traffic into her store continued to diminish.No one wanted to walk behind vendors to check out the shops on Hopkins Avenue, she said. In 2003 her summer business was still slow, and she said in 2004 she noticed that at least five of the craft vendors were selling products similar to her own. “I imagine they’re doing pretty well,” she said, “considering I’m not selling anything on those days.”Marcus said Saturdays became a day when she made just $100 in the summers. And when she complained to the organizers of the Saturday Market, she said, they told her that the next summer she could have a booth of her own.”To hire someone to sit in my store so I can sit 10 feet away from my store seemed ridiculous,” she said. “I shouldn’t have to compete with my own store.”In 1998, when the farmer’s market was brand new, a number of downtown business owners spoke against holding the market in the commercial core since the venture “might increase traffic but decrease parking.” But the market instead expanded in the last few years to include craft booths and to stretch from Hopkins Avenue up one block of South Hunter Street.